The case: A 48-year-old woman visited her family physician because of gradual-onset dyspnea, fatigue and an occasional cough. Dyspnea occurred when the patient walked up stairs, in the cold or against the wind, but it did not occur when she was at rest or lying down. She denied having associated chest pain. The patient had received a diagnosis of mild asthma at 22 years of age; however, asthma medications had not been required since she was in her early 30s. The patient was a nonsmoker, had a body mass index of 21 kg/m2 and, for the past several years, had exercised for 1 hour 3 times per week but reported having decreased exercise tolerance. On examination, the patient appeared to be well, and her vital signs were normal. A chest examination was unremarkable except for slightly decreased breath sounds at the base of the lungs. 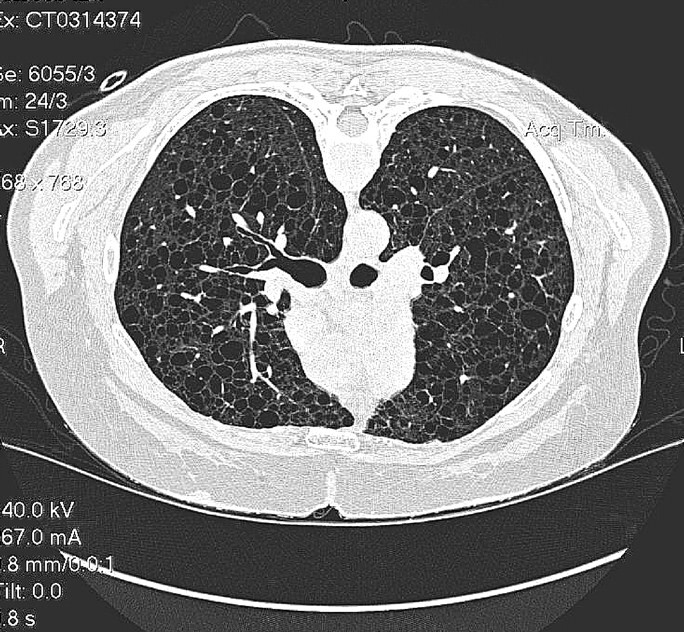 A chest radiograph initially appeared to be normal, although on closer review linear bronchial opacities were identified. Results of pulmonary function tests were as follows: forced vital capacity (FVC) 88% predicted, forced expiratory volume in 1 second (FEV1) 65% predicted and 73% post bronchodilator, FEV1/FVC 74%, total lung capacity 106% predicted and residual volume 140% predicted. The patient was referred to a respirologist, who diagnosed chronic asthma. Results of a histamine challenge test showed a 38% reduction in FEV1 at a histamine concentration of 4 mg/mL. Inhaled steroid and salbutamol therapy was prescribed. At a 6-month follow-up visit, the patient reported an improvement in her symptoms and improved exercise tolerance. Her FEV1 was 60% predicted. Several months later, after the patient began experiencing increased fatigue and prolonged symptoms of an upper respiratory infection, she visited a second respirologist. Again, results of the clinical examination were normal. Pulmonary function test results revealed a FEV1 53% predicted and 61% post bronchodilator, and diffusing capacity of the lung for carbon monoxide 46% predicted. Exercise test results showed that oxygen saturation declined from 97% to 90% on exertion. Arterial blood gases revealed partial pressure of oxygen of 66 mm Hg. Results of laboratory tests (including α-1 antitrypsin level) were normal. A chest radiograph revealed nonspecific coarse linear opacities in the base of both lungs, which suggested parenchymal scarring or bronchiectasis. Fig. 1: CT scan of chest showing cystic changes. We made a diagnosis of an obstructive disease that required further investigation. The patient was sent for a high-resolution CT scan which revealed emphysematous and cystic changes in the base of the lungs (Fig. 1). The differential diagnosis included lymphangioleiomyomatosis and eosinophilic granuloma. A bronchoscopy and transbronchial biopsy were recommended but were declined by the patient. A working diagnosis of lymphangioleiomyomatosis was made after an abdominal and pelvic CT scan revealed small renal lesions (4 mm) on both kidneys consistent with angiomyolipoma (Fig. 2) and enlarged retroperitoneal lymph nodes (< 1.5 cm in diameter). An MRI of the brain ruled out a hamartoma consistent with tuberous sclerosis complex. A course of pulmonary rehabilitation followed; the patient received oxygen therapy (2 L/min, 4 L/min during exercise). Fig. 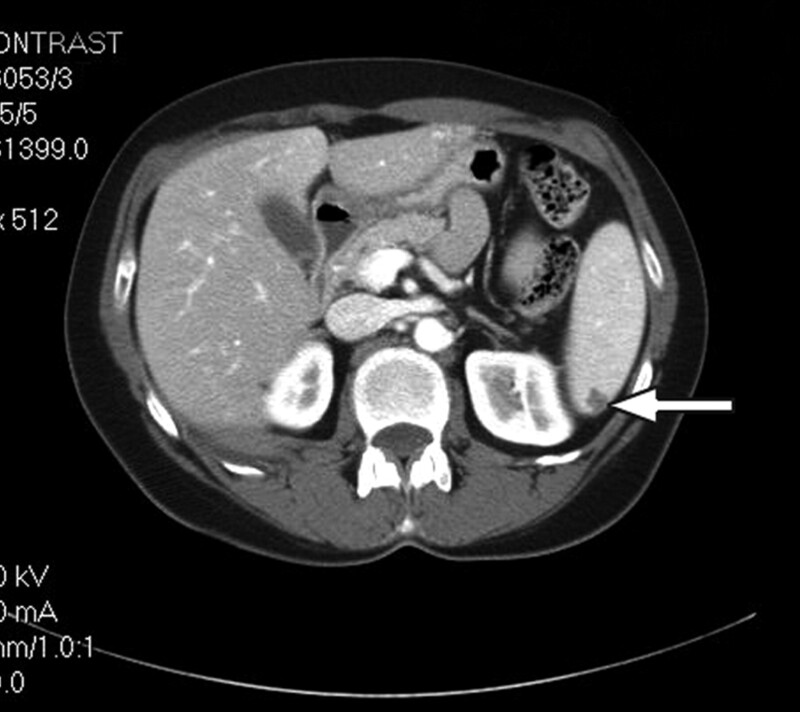 2: CT scan of the abdomen showing renal angiolipoma (arrow). Lymphangioleiomyomatosis is an underdiagnosed, progressive and often fatal lung disease that has an insidious onset. There is currently no treatment or cure. The condition occurs primarily in women between 30 and 49 years of age but has been reported to affect patients as young as 17.1 There are 2 forms of lymphangioleiomyomatosis: sporadic or associated with tuberous sclerosis complex. Both forms are caused by mutations in tumour suppressor genes: the hamartin gene (TSC1) on chromosome 9 (9q34) and the tuberin gene locus (TSC2) on chromosome 16 (16p13.3). Estimates from lymphangioleiomyomatosis registries suggest that, worldwide, the sporadic form affects about 30 000–50 000 women and the form associated with the tuberous sclerosis complex about 180 000–240 000 women. There are no specific epidemiologic risk factors for lymphangioleiomyomatosis, including family history. Lymphangioleiomyomatosis has been termed a great “mimic”; affected women frequently receive a misdiagnosis of asthma, emphysema or pulmonary fibrosis. A high index of suspicion and a high-resolution CT scan leads to the correct diagnosis in about 80% of cases. With a CT scan and supporting clinical evidence, a lung biopsy may not be necessary for a definitive diagnosis. Treatment of lymphangioleiomyomatosis is supportive and generally includes avoiding medications that contain estrogen (although not supported by evidence, it is presumed that estrogen plays a role in the predilection of the condition among women). Additional supportive measures may include bronchodilator therapy, treatment of anxiety and depression, pulmonary rehabilitation and assessment for hypoxemia and pulmonary hypertension, supplemental oxygen therapy and lung transplantation. In general, a lung transplant should be considered when FEV1 approaches 30%. Embolization or cauterization of renal tumours may also be required. Recent studies suggest that the median survival from the onset of symptoms is about 15 years. The complications associated with lymphangioleiomyomatosis are extensive and greatly affect women's daily lives. As international lymphangioleiomyomatosis registries mature, more information is becoming available about the symptoms, prevalence and natural history of this disabling condition. Basic scientific research into lymphangioleiomyomatosis has led to an international randomized trial of rapamycin that will begin shortly. Cohen MM. Pollock-BarZiv S, Johnson S. Emerging clinical picture of lymphangioleiomyomatosis. Thorax 2005;60:875-9. Ryu J, Moss J, Beck G, et al. The NHLBI lymphangioleiomyomatosis registry: characteristics of 230 patients at enrollment. Am J Respir Crit Care Med 2006;173:105-11. Pollock-BarZiv S, Cohen MM, Downey GP, et al. Air travel in women with lymphangioleiomyomatosis. Thorax 2007;62:176-80.